Successive US governments have used a range of carrots and sticks to entice or pressure the North Korean leadership to give up its nuclear programme. 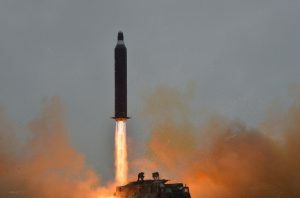 The North’s missile launches and nuclear tests in 2016 make plain that these efforts have failed; in short, the West has to accept that it is now a nuclear power and focus instead on limiting the risks a nuclear North Korea presents. But it also pays to consider what sounds like a perverse question: could a North Korean bomb actually benefit both the country’s people and the world at large? First, a reality check: the North Korean nuclear programme is less a madcap scheme than a clear and deliberate strategy. Its leaders have closely watched what’s happened to other countries that have backed away from nuclear arsenals, and two in particular: Ukraine and Libya. Ukraine gave up its massive Soviet-era nuclear arsenal in 1994 when it signed the Budapest Memorandum with Russia, the US and the UK, on whose terms it traded nuclear weapons for a formal reassurance to respect its sovereignty; 20 years later, Moscow invaded and annexed the Crimean peninsula, and a pro-Russian insurgency in the east is still rumbling. As for Libya, Muammar Gaddafi renounced his weapons of mass destruction programme as part of an opening to the West only to be forcibly removed from power by the same countries some eight years later. Along with the Iraq War, these spectacles taught the North Korean regime that it’s hard for a relatively small, isolated country to survive without the military hardware to guarantee it. Pyongyang has duly shown great diplomatic skill in drawing out nuclear negotiations, buying itself both time and financial aid as its programme moves forward. A nuclear North Korea obviously worries the international community for several reasons. Kim might in theory actually use nuclear weapons on his enemies, a threat he periodically makes. His country’s admission into the “nuclear club” might spark a regional arms race. It could share or sell technologies of mass destruction to hostile states. And then there’s the danger of a full-blown nuclear accident with all the attendant regional repercussions. These risks aren’t trivial, but they should be viewed with some perspective. For starters, a nuclear attack from Pyongyang appears highly unlikely. The government is fully aware that it would incur an overwhelmingly destructive military response from the US and South Korea. It’s also worth remembering that while the programme has been underway for 25 years, there is still no sign of a regional nuclear arms race. As for proliferation or accidents, these demand not isolation but co-operation and communication. Keeping Pyongyang cut off from the world will not help; if its nuclear facilities are to be kept safe and their products not used to bring in illicit foreign revenue, they must be properly monitored rather than kept hidden. With a smaller conventional military to maintain, Pyongyang might be able to channel scarce state funds away from defence and towards raising the standard of living for ordinary North Koreans. This point is in line with its stated strategy of growing the economy and developing the nuclear deterrent in parallel, a policy known as the Byungjin line, and with Kim’s mooted five-year economic plan. 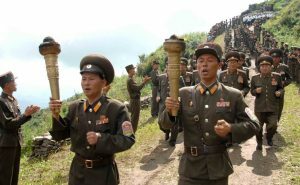 His plans demand dramatic shifts in North Korean state policy, which could destabilise the regime. The calculation is that the security provided by nuclear capabilities would offset the shock of sudden domestic change. Most paradoxically of all, North Korea’s nuclear “arrival” might make for a positive turn in inter-Korean relations. International efforts to eliminate North Korea’s nuclear programme isolated the country, in turn greatly undermining the chances of a rapprochement with the South, whose efforts to defrost relations have lately come to nothing. The pace of the North’s nuclear development meant that the now-impeached President Park’s policy of reconciliation – “Trustpolitik” – was doomed before it began. 06/02/2017 in East Asia, Korea.